For cities that don’t have bike lanes to keep riders safe — especially at night — LightLane is a company trying to rectify the problem. 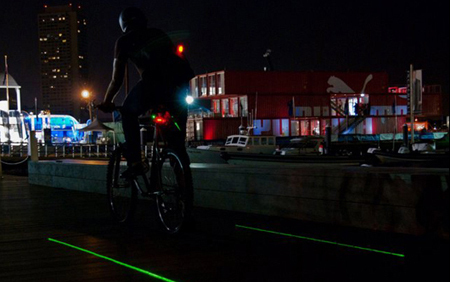 The company is designing a rear bike light that creates a laser-lit virtual bike lane that goes where you go. It’s in the prototype phase now. 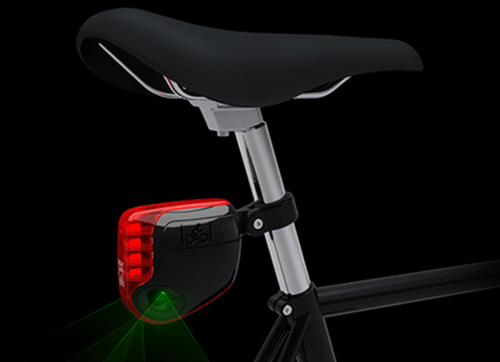 When complete, the light will attach to your bike’s seat post and shine a green laser to the left and right behind you as you ride, providing a five-foot-wide, 12-foot-long moving bike lane. Besides the green bike lane lasers, the product has traditional red LEDs to help alert drivers you’re there. The light runs on a rechargeable lithium-ion battery said to last three hours on a charge.